Do I need physio for my sprained ankle? Ankle sprains are one of the most common sporting injuries that present to physiotherapy and are easily sustained in both contact and non contact sport. With any ankle sprain it’s imperative to seek advice and rehabilitate 100% to avoid any ongoing pain and instability with the ankle. Evidence has shown a sprained ankle has one of the highest re-injury rates at up to 70%. So it’s important to rehabilitate the injury completely. Our ankle has two separate joints, one for bending the foot up and down and the other for turning the foot in and out. It is the joint responsible for turning the foot in and out that is sprained with a typical ankle injury. The ankle will normally roll inwards, and often when the foot is in a pointed position. This is the least stable position for the ankle. 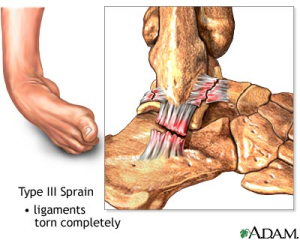 This then causes a stretch for the ligaments on the outer side of the ankle (see diagram) which may then tear under the strain. Why are my ankle ligaments so important? The ligaments within the ankle stretch like elastic to allow the ankle to move. They will only stretch so far as to keep the ankle stable. The stretching of these ligaments provides critical information to the brain regarding the position the ankle is in. 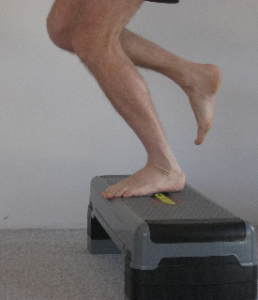 This information is used by the brain to determine what muscles need to activate to assist in stabilising the ankle. Think of these ligaments as little sensory receptors that allow us to feel our ankle moving without requiring us to constantly be looking down at them. These sensory receptors are what allows us to balance on one leg or run on unstable ground without rolling our ankles. What things should I be able to do before I return to the sporting field? 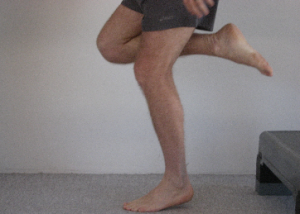 Knee to Wall (KTW) test is a simple but effective means of measuring your ankle joint range of motion. 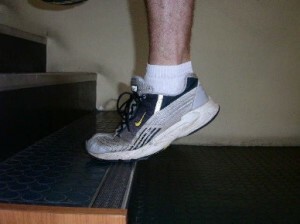 The test is performed by determining how far your injured foot can be placed away from the wall without your heel lifting off the ground, whilst trying to bend your knee to touch the wall. Measure from the tip of your big toe to the wall and compare this to the unaffected side, they should be the same. 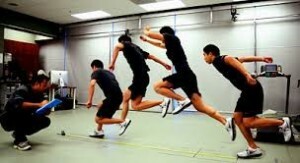 The Hop length test is performed by standing on the injured leg and hopping as far as you can landing on the injured leg. Measure the distance from the big toe at the take-off position to the heel at the landing position and compare to the other side. They should be within 5cm. 3) return as high as possible on toes. 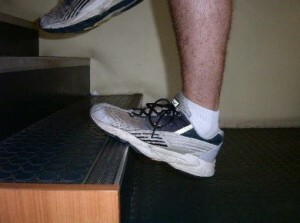 The final test for any healed ankle is to hop up onto a step and down single leg. The task sounds easy but attempt first with your uninjured ankle before attempting the injured side. You should be able to do 10 reps each side and feel confident in both ankles. If you can’t comfortably perform the above exercises after your ankle injury then you should seek the advice of one of our Physiotherapists. What will your physiotherapist do? Most importantly, your Apex Physio will assess and rule out any serious injury such as a fracture. If required your Physio will organize for a referral for an X-ray though this is rare. Once a fracture has been ruled out, then we know it is a soft tissue (ligament) injury which normally take 4-6 weeks to heal. Reduce the pain and swelling. Your Apex Physio may use soft tissue massage, joint mobilizations and taping in conjunction with gentle range of motion exercises. This will help reduce your pain and swelling, allowing you to walk as normally as possible. Following on from these stages, it is important to restore any muscle strength deficits, proprioception and commence functional exercises and sport specific exercise. These exercises will be prescribed for you when it is appropriate. Once these can be performed pain free and with no limitations, you will be free to return to full competition. With the winter sports season just beginning if you haven’t recovered from that old ankle sprain or have a fresh sprain from the week end, get in and see one of our physiotherapists. They will have you back on the track in no time!